Homemade Vanilla Fudge Swirl Ice Cream for those of us that can’t decide between chocolate or vanilla? Yes, please! Last year I came across a super delicious 3-ingredient ice cream recipe that required no ice cream maker. If you didn’t read the original post, it was quickly declared the boyfriend’s favorite ice cream ever, store-bought or homemade. While he has a boring ice cream personality and is quite content to eat plain vanilla ice cream all the time, I like various ice cream flavors now and then. Back in December, it was the boyfriend’s birthday and he requested a marble cake with ice cream. The resulting ice cream is just as good as the original. The homemade vanilla ice cream is creamy and smooth and the hot fudge has a chocolate flavor that is just rich enough without being too sweet that accents the vanilla perfectly. 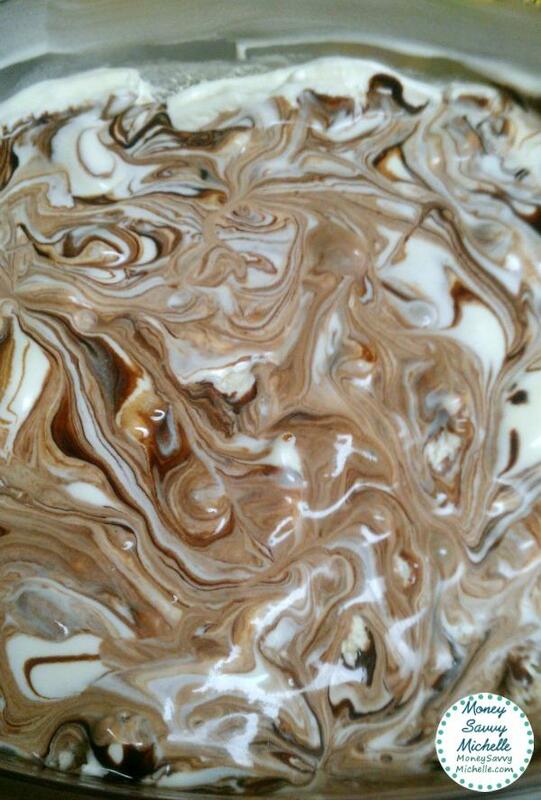 The vanilla fudge swirl ice cream is great on its own, to make a sundae with, on brownies, and of course, cake. It’s also great for Valentine’s Day desserts since it’s full of yummy chocolate flavor. This delicious Vanilla Fudge Swirl Ice Cream only uses 4 ingredients and doesn't even need an ice cream maker! Place cream and vanilla into large bowl or bowl of stand mixer and whisk or mix until stiff peaks form. Using a cold bowl/whisk/cream will help your cream whip faster. Once you have whipped cream, pour the sweetened condensed milk over the top and gently fold it into whipped cream. Pour mixture into a 2-quart freezer-safe container and cover. For this flavor I like to use a wide container versus a deep container to make swirling in the hot fudge easier later on. Freeze for at least 2-3 hours. The goal is to have partially frozen ice cream so that you can swirl in the fudge without making chocolate ice cream, yet not have the ice cream be so hard that it is impossible to swirl in. Once partially frozen, remove from freezer and pour thick long ribbons of fudge over the ice cream, about 1/2 inch apart. 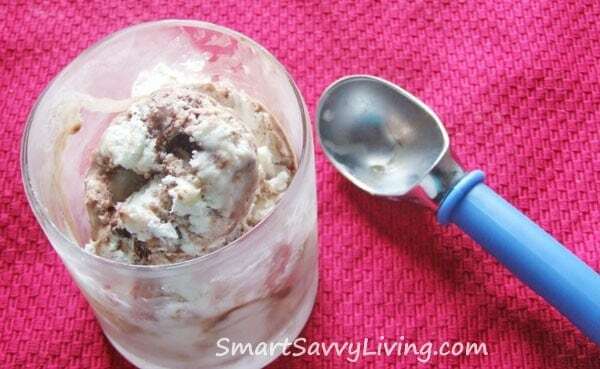 Using a knife or chopstick, swirl the hot fudge into the ice cream in figure 8 motions. You don't want to stir it in or you won't really have swirls. Make sure to take the knife or chopstick all the way to the bottom of the container. See pictures below for reference. Replace cover and freeze for an additional 3+ hours or until fully frozen. Once frozen, scoop and enjoy. Note that this ice cream should not get rock hard unless your freezer is very cold, and thus shouldn't need to sit at room temperature long, if at all, to scoop. Leftovers may be kept in the covered container and frozen. 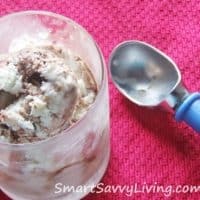 I hope you enjoyed this Homemade Vanilla Fudge Swirl Ice Cream recipe – be sure to check out our other ice cream recipes! This sounds amazing. I never knew you could make ice cream without a ice cream maker. I so want to try this. You could make a sstrawberry swirl too. Or add peaches. Thank you so much for tgd recipe. This looks awesome, Michelle!! I constantly crave ice cream and this looks so incredibly easy. Thanks, Jen! It still amazes me just how good and creamy this ice cream is for being so simple. I love this recipe! I have shared it all over the web. ;) Anytime you wanna guest post??? :) I’ll take it! This is awesome! I’ve never made homemade ice cream before because it always seemed too difficult with the recipes that require ice cream salt and ice cream makers and such. I’ll have to give this one a try!